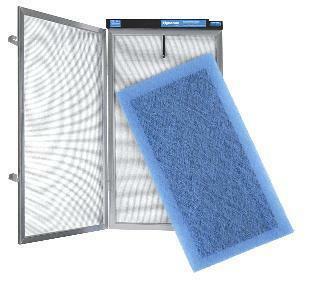 Electro Breeze brand air filter pads are the same as the Dynamic brand carbon air filters! The tests have been performed, the materials are the same, the only difference is the price. If you want to get technical, there is a difference in how they put them together. Electro Breeze uses plastic staples that look like clothing tags, where Dynamic Air Quality Solutions (also known as Engineering Dynamics Group) uses glue. The only purpose for either style is to keep them together until you install the pad. Once the pad is installed, it no longer needs staples or glue. NOTE: Yellow or Blue coloring of pads is simply different dye colors. There is no difference in performance or quality. Why does Electro Breeze costs so much less? Electro Breeze and Dynamic compare when it comes to performance, but Electro Breeze has cut their prices to gain market share. With the dawn of the Internet and free information, more and more of our competitors customers will enjoy these savings. Dynamic Air Quality Solutions (also known as Engineering Dynamics Group) also claims that your warranty will be void if you use anything other than genuine Dynamic carbon air filters. This is simply not true since both brands use the same technology in the same way utilizing the same media pad. Dynamic air cleaners are as efficient and effective as the Electro Breeze air cleaners, since they use the same technology by the same means of air filtration. Really, the only deficiencies of the Dynamic air filter are the unreliable powerhead and the sharp corners of the frame. If your powerhead goes out in the first five years, rest assured, it is not because you did not use the Dynamic replacement media air filter pads, it is because the powerhead is faulty from the factory. Be sure that you use the Electro Breeze brand or the Dynamic air cleaner filters, since no other brands have testing to back up their claims. Always ask for the test data before purchasing. Since Dynamic Air Quality Solutions (also known as Engineering Dynamics Group) is the manufacturer of the brands Natures Home MicroPower Guard® and One Hour Xenon Power Guard®, the Electro Breeze air cleaner media pads can also be used in those brands. Click here to learn more about the relationship between Dynamic AQS, Natures Home, Water Furnace Geothermal and One Hour Heating and Air Conditioning.